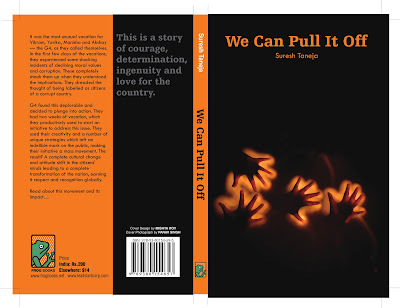 In his debut book, Suresh Taneja attempts to find a solution for the most rampant problem facing our country – Corruption. And he does this not by preaching or boring us with moral lectures but by writing a story about four friends who come together to transform our country. The book begins in 2030 where India is entirely different from what we see now. India has become a super power that is actually providing aid to countries like U.S and Indian companies are the biggest and the best in the world. The four friends, who were the key alchemists in bringing about the revolution, tell their kids how they went about it. I am not going to go too deep into the story because I really dont want to be a spoiler, but what I like best about the book is the fantastic ways in which the author provides solutions to the problems facing our country. The solutions are innovative and yet so grassroot and simple that one wonders why our country doesn’t actually implement them.This book is a brave attempt by the author to write about the situation in our country and how all of us can come together to make India a better place. Unfortunately, the book falters a bit as far as narration and characterization is concerned. The narration drags at many places and none of the characters are talked about in depth anywhere. The author just skims over and sketches a brief characterization of the four friends and so the reader is not able to connect well with them. The book also tends to be repetitive at times and lacks a good flow at many places. This book is a refreshing change from the usual campus stories and teenage romances but purely from the literary point of view, this book lacks finesse and fails to engage fully. @Swaram,alphabetworld - thanks for reading! yes narration and characterization is what I always look for in a book ! I am the author of the book. I don't claim to be a literary writer - Infact through a medium of a book, I wanted to convey some thoughts and ideas, which have assumed enormous relevance today. My request to readers is to wear the hat of a nationalist or a conerned citizen of the country while reading the book. I promise, the book will not let you down in respect.